We are not currently offering the Trainer Certification Program, but if you would like training sessions at your farm, please call or email for information. Would you like certification for horse training and a career as a horse trainer? Would you like to learn more about safe, effective, natural horsemanship training methods? Then you’ll want to be part of our next Trainer Program! This is one of the best hands-on trainer programs available to improve your training knowledge and skills specializing in John Lyons’ methods. Join the best trainers who have discovered what an incredible opportunity this program can be. It can change the way you work with horses, your life and your income potential, even if you just want to train your own horses. We offer a small class size, only about 5 students, with plenty of time for individual attention and help. A large percentage of our graduates go on to successful horse training careers. Many have their own training businesses, and some have been featured clinicians at top-rated equine events such as Equine Affaire and VA Equine Extravaganza. 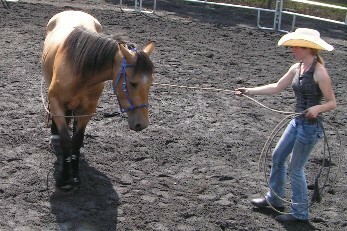 Emily trains her adopted PMU gelding. He was 3 years old and had not been handled or led. You will need a broke and an unbroke horse. We can assist you in finding horses for the Program. You will start the unbroke horse under saddle and teach the broke horse upper level performance work. There will be a maximum of about 5 students per class to allow for plenty of individual instruction and answering questions. 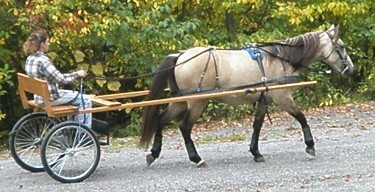 Starting in spring, there will be 5 sessions, each 2 or 3 weeks long at Cedar Creek Training Stables in Millville, PA. Between sessions, you will have several weeks at home to practice before returning for the next session. Graduation will be in October. We recommend you attend at least 2 Apprenticeships before applying for the Trainer Program. See Schedule for Apprenticeship dates. After getting her unbroke filly broke to ride, Kim also taught her to drive! If you would like to be part of this incredible Trainer Program, contact us for more information or to attend an Apprenticeship and get started!